Magnesium assists in utilising proteins and calcium. It is necessary for energy production and helps the proper functioning of muscles and the nervous system. 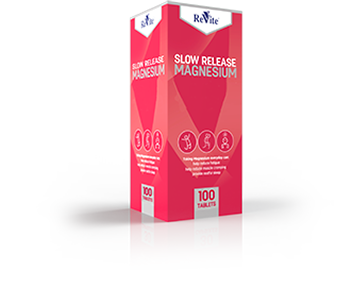 • Revite Magnesium is a Matrix Controlled Release tablet. • The matrix is under the enteric coating and gives shape to the tablet and allows the magnesium to diffuse into the intestine once the enteric coating has dissolved. • It releases the Magnesium from the magnesium Chloride present in the matrix core, through the process of diffusion, into the small intestine over a 3-6 hour period. • The matrix core will not dissolve, but will be passed through the body with normal bowel function. • Depending on a person’s diet and intensity of peristalsis, the empty core matrix core may remain relatively intact and be visible in the stool, however, the magnesium chloride will have completely diffused from the tablet core.